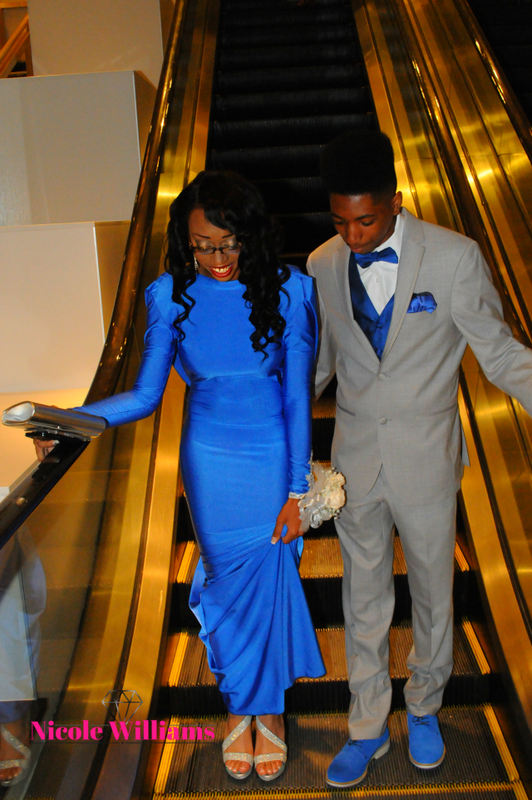 Senior prom is one of the most anticipated and elegant experience of high school. The perfect finale, aside from graduation, where your 17 year old feels like a celebrity heading down the red carpet with the paparazzi capturing every prance and turn. Senior proms is definitely more elegant and lavish than junior proms - it is the senior milestone which many high school teenagers dream of. One of the most magical evening of the year, and the most elegant finale to high school. On Monday my daughter had her senior prom, which was held at the beautiful Riviera Caterers, known for their elegant high-end catering experience. With that said you know the dress had to be fancy and stunning. My daughter knew she wanted a dress she would absolutely love and that no other girl would be wearing. So the obvious choice was to custom make a gorgeous dress for the prom. She went with a long sleeve, drupe backless, blue gown with a mini-train made by Versailles in Brooklyn. Thank you Moussa! The outfit was completed with glam accessories to add some bling – a pair of stunning silver platform heels, a silver clutch, and chandelier earrings. Even her nails got be-jeweled. My baby looked like a princess. Her date who was a perfect gentleman, wore a gray suit with blue loafers, bow-tie, vest, pocket square to match her dress. These days the possibilities for after prom plans are pretty much endless. But the after prom central for the students at my daughter’s school was at the newly renovated and with a new location right in the heart of New York City, the world renowned Copacabana. For the prom after party she wore a Charlotte Russo white crocheted, capped sleeve, shorts romper, completed with her silver clutch, and a pair of floral print heels. And of course you know I had to take a photo with my gorgeous prom queen, to capture the moment. I still can't believe she is so grown - a beautiful young lady, with the brains to go. Credits: Photos by James Allen Thompson, Makeup by me (Nicole Williams). View more pics below by clicking the first image for the slideshow. What do you think of her senior prom look?